When you make your own homemade tomato juice from scratch, you will never want to buy it from the store again. Pure and refreshing; so good for you. Offering fresh fruit and vegetable recipes and much more. This recipe makes 4 cups of tomato juice. Cut away the stem and any blemishes on the tomatoes. Quarter them and leave the skin on; place in a saucepan. In the pan with the tomatoes, add the 1/2 cup of water. Bring the mixture to a simmer and crush the tomatoes to release the juice. Cover and simmer slowly for 30 minutes and then remove from the heat and cool for 10 minutes. Carefully strain and have a bowl under the sieve to catch the juice. You can reserve the pulp for any recipe that uses stewed tomatoes. Fill a large tumbler with ice and pour in the vodka. Add the olives and brine. Season with the celery salt, pepper, worcestershire sauce and hot sauce. Fill the remainder with the tomato juice and stir well. Add the celery stick, and sprinkle the top with the celery salt before serving. 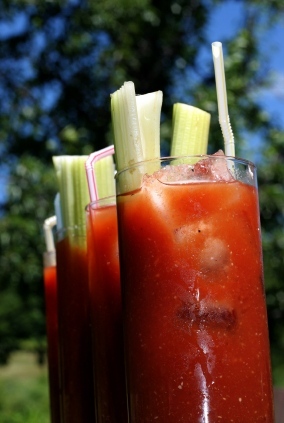 Bloody Mary's are really made according to one's personal tastes. If you want more olive juice or worcestershire sauce; add more. Enjoy.